On Sunday, April 23rd, seven Mercy Multiplied residents were baptized at Destiny Church in St. Louis, Missouri. “For the first time in my life, I have freedom from oppression, and I’m walking in Christ’s resurrection power. I was excited for a chance to publicly lay my old life to rest,” said one Mercy resident, expressing her excitement to be baptized. 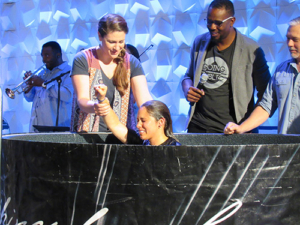 The residents were baptized by Pastor Stern’s wife, Jessica Stern, as well as the youth pastor, Jonathan Thomas, and staff pastor, Jeff Allensworth. All of the current St. Louis Mercy residents attended the service to encourage their sisters for making the courageous decision to publicly display their commitment to God. To listen to Pastor Stern’s full message from this baptism service, please click here. 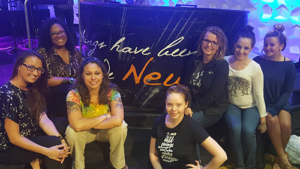 Mercy is grateful for the support of Pastor Stern and Destiny Church and for the “church home” provided to the St. Louis residents as they learn and grow their faith.